There are many components of a satisfying college experience. The list might include challenging courses instructed by well-respected faculty members, state-of-the-art research facilities, a diverse campus population, student-led clubs and organizations, and low tuition. While the criteria for an enjoyable college experience ― as well as the overall experience at a particular institution ― will vary from student to student, certain statistics can be used to determine which schools seem to produce the highest number of 'satisfied' students. This list includes the 15 private and 15 public universities with the highest rates of student satisfaction, as determined by data points like student retention, student-to-faculty ratio, and the percentage of alumni who donate money to their alma mater. Our goal is to provide a resource for students who want to focus their college search on schools that prioritize in these areas. Princeton boasts a higher student satisfaction than any other school on our list ― which shouldn't come as a big surprise, since the Ivy League university is also widely considered one of the finest academic institutions in the country. In 2013, U.S. News & World Report ranked Princeton first among all national universities. The school's most renowned academic offerings include graduate-level programs in science, engineering, and architecture, as well as numerous degrees available through the Woodrow Wilson School of Public and International Affairs ― but notably, the university does not host medical, law, or business schools. Princeton boasts a prestigious list of alumni that includes two U.S. presidents, three current Supreme Court justices, and 35 Nobel Laureates. Dartmouth is the smallest university in the Ivy League system (by enrollment); as such, the school's popularity with students offers superior academic programs within an intimate setting. The university's long history of inclusion begins in 1789, when Dartmouth was founded to educate both white settlers and local Native Americans. The campus today is home to an extensive Greek system more than 200 student clubs and associations, as well as traditions like the four-day Dartmouth Outing Club retreat for incoming freshmen. Nearly 12,000 students attend this Catholic research university, which is perhaps best known for its Fighting Irish football program and the die-hard fans that follow the team cross-country throughout the season. In addition to athletics, Notre Dame also boasts a large College of Fine Arts and Letters (which awards 33 different undergraduate majors) and Mendoza Business School, which is widely regarded as one of the best (and most cost-effective) b-schools in the country. Notre Dame is also distinguished by its commitment to environmental sustainability and green technology; seven on-campus buildings are LEED-certified, and 47% of the food served in dining halls is locally sourced. Yale's admission rate for incoming freshmen is relatively low (only 6.7% for the Class of 2017), but those who are accepted gain access to one of the most highly regarded universities in the world. Yale's law, business management, medicine, and biology programs are all well-renowned (and well-funded), while the school's forestry and environmental studies department (founded by noted conservationist Gifford Pinchot) spearheads many on-campus sustainability projects and initiatives. Among its alumni, Yale boasts five U.S. presidents, 19 Supreme Court Justices, and 51 Nobel Laureates; Yale also has the second largest endowment of any higher-learning institution in the country (behind Harvard). Claiming the highest endowment of any learning institution in the world (more than $30 billion in 2013), Harvard (the country's oldest university) is today synonymous with superior academic offerings. The school offers more than 200 undergraduate, graduate, and professional degrees for students; its most reputable programs include education, law, business management, and medicine. The Harvard University Library is also the largest collegiate library in the country. Eight U.S. presidents (including the last two) and more than 150 Nobel Laureates are included on Harvard's distinguished list of alumni. In 2013, U.S. News & World Report listed Harvard as the second best national university (after Princeton). A member of the Ivy League as well as one of the original nine colonial universities, Penn boasts a long history of academic excellence. Both the University of Pennsylvania Law School and Wharton School (of business management) are regarded among the best in their respective fields. The school places great emphasis on comprehensive education, and offers many joint degree programs allowing students to blend two or more disciplines (at both the undergraduate and graduate levels) and craft a degree that matches their specific career aspirations. Penn also boasts one of the country's most renowned rowing teams, which was founded in 1854, while the school's marching band, glee club, and student newspaper (The Daily Pennsylvanian) all date back to the 19th century. Brown was the first higher-learning institution in the United States to accept students of any religious faith, and the culture of inclusion and diversity at the Providence university has remained intact to this day. The school currently boasts more than 300 student clubs and organizations, as well as The Brown Daily Herald (in circulation since 1891) and nine other newspapers, literary journals, and other student-led publications. In 2010, The Princeton Review named Brown as the top school for "Happiest College Students" in the U.S. Since its foundation in 1876, Johns Hopkins has earned a stellar reputation in the fields of science, medicine, and academic research. According to the National Science Foundation, JHU has led all colleges and universities in science and engineering R&D spending for the past 35 years; this expenditure is largely thanks to NASA, which has awarded the university more than $1 billion in research grants. In addition to top-ranked STEM programs and seven locally affiliated hospitals, Johns Hopkins is also home to the Center for Talented Youth, Lieber Institute for Brain Development, and the Human Language Technology Center of Excellence. Sports fans around the country celebrate the Duke Blue Devils ― one of the the winningest hoops squads in NCAA Basketball history ― but this prestigious university has much more to offer than stellar athletics. In addition to 50 undergraduate majors, the school's Program II and IDEAS degree pathway enable students to create their own curriculum and customize their major. Academic research is another strong suit of the university; Duke ranked fifth (behind in terms of research expenditure during Fiscal Year 2011, according to the National Science Foundation, and the school's researchers have played a role in memorable projects like the Human Genome Project and development of the AIDS vaccine. The University of Virginia outranked all other public universities in terms of student satisfaction, and was the only such school to earn a rating above 70%. Founded in 1819, the institution is considered one of the eight 'Public Ivy' universities, and is the only campus in the U.S. to earn distinction as a UNESCO Heritage Site (Presidents Jefferson, Madison, and Monroe were among the original trustees). U.S. News & World Report ranked Virginia as the nation's second best public university in 2013. The second oldest higher-learning institution in the country (behind Harvard), William and Mary was founded in 1693 and today is home to well-renowned law, medicine, education, public policy, and marine science programs. Students may also take part in joint degree programs with two other eminent schools, New York's Columbia University and Scotland's University of St. Andrews. The school's student-to-faculty ratio of 12:1 is also the second lowest among all public universities in the country. Soccer superstar Mia Hamm and basketball legend Michael Jordan are just two of the many professional athletes who hail from UNC. In addition to the school's athletic division, UNC's academics have also drawn acclaim nationwide; the school placed fifth among all public universities in U.S. News & World Report's 2013 ranking, while the Gillings School of Public Health, UNC Eshelman School of Pharmacy, and UNC Department of Public Policy have also earned numerous accolades and favorable rankings. The school is also relatively diverse, with minority groups comprising more than 30% of the student population. Georgia Tech has long been regarded as one of the finest schools for engineers in the world; the institute currently offers more than 50 undergraduate, master's, and doctoral degrees in this field ― although the school also offers degrees in business management, liberal arts, computing, architecture, and natural sciences. Georgia Tech also maintains strong ties with local employers, and offers many internships that effectively prepare students to not only enter the workforce, but also compete for jobs within the Atlanta area. In 2005, Clemson University ranked 34th among all public universities in a ranking compiled by U.S. News & World Report; the school has gradually improved its rankings over the last eight years and, in 2013, tied for 21st place on the same list. The school also has a strong presence of students who serve in the U.S. military and a relatively high Greek following, with nearly a quarter of undergraduates belonging to an established fraternity or sorority. Penn State's Smeal College of Business is regarded as one of the best public university b-schools in the country; a recent survey of corporate executives conducted by The Wall Street Journal found that Penn State was the top school for training and educating prospective business professionals. The school has also boosted its research expenditure in recent years, ranking 11th on the National Science Foundation's list of top public and private universities by R&D spending. As a land, sea, and space grant institution, Texas A&M offers a plethora of academic options to its student body. The Dwight Look College of Engineering comprises more than one-fifth of all students, and offers degree programs in 12 different engineering-related fields. Additionally, the College of Education and Human Development, Mays Business School, and College of Agricultural and Life Sciences each educate more than 5,000 students per year. With more than 58,000 students currently attending the College Station campus, Texas A&M is the largest school on our list (by enrollment). Texas A&M was also one of 13 U.S. higher-learning institutions to generate more than $100 million through its football program in 2013. Despite claiming the smallest endowment of any university in the Southeastern Conference (SEC), Auburn has been ranked among the top 50 U.S. public universities by U.S. News & World Report for more than 20 years, claiming the #40 slot in 2013. Auburn's undergraduate architecture, interior design, and industrial design programs have also earned praise, having been named among the best in the country by DesignIntelligence in a 2013 industry poll. The Auburn Tigers football team also has a loyal fan following, with three alumni (Pat Sullivan, Bo Jackson, and Cam Newton) earning the Heisman Trophy while playing for the university. Florida State University's extensive offerings include roughly 300 degree programs offered through 16 specialized colleges and more than 100 other on-campus centers and facilities. Regarded as a member of the 'Budget Ivy' university system, FSU has been dubbed a 'high-value college' by The Princeton Review. The school also boasts an ROTC program that dates back to the Civil War era, and operates the FSU Coastal and Marine Laboratory located about 45 miles from the main campus. The University of Alabama (or just 'Bama) boasts arguably the most celebrated college football team in the country; the Crimson Tide have won 15 national championships, and the team has produced 18 entrants in the Football Hall of-Fame. Athletics aside, the university also boasts an extensive library system (containing more than 3 million volumes) and annually receives upward of $50 million in federal research grants each year. Alabama is home to 13 professional schools, including the College of Arts and Sciences founded in 1909 and the world-renowned School of Law established in 1872. The following data points are listed for each school on our lists of 30. Student retention rate: This figure represents the percentage of freshmen students who complete a full or partial academic year, and then return for their sophomore year. Other grade levels were not considered for this data point. Six-year graduation rate: This figure indicates the percentage of students who complete an undergraduate (four-year) program within six years, which represents 150% of the typical completion period. Six-year graduation rate does not apply to advanced degree programs. Student-to-faculty ratio: This refers to the number of students that correspond to each faculty member. At smaller institutions, the ratio will usually be 10:1 or lower; at larger universities, the ratio may be 30:1 or higher. Relatively low ratios indicate a school's emphasis on individualized education for students. % of alumni who give back: This figure indicates the percentage of graduated students who donate money to their alma mater ― although individual donation amounts did not factor into this percentage. Total endowment: The endowment is the amount of money given to the school from the federal government, as well as private companies, organizations, and individual donors. Student satisfaction: This percentage is derived from three other data points: student retention rate, six-year graduation rate, and the percentage of alumni who give back. Student-to-faculty ratio and endowment did not influence our satisfaction rates. To build our list, we gathered data from two authoritative sources. Student retention and six-year graduation rate were obtained from the National Center for Education Statistics IPEDS database. The student-to-faculty ratio, percentage of alumni who give back, and endowment figures were curated from individual school pages found on U.S. News & World Report, which is widely considered one of the most authoritative college-ranking sites. It's important to note that the data will vary considerably between private and public universities. 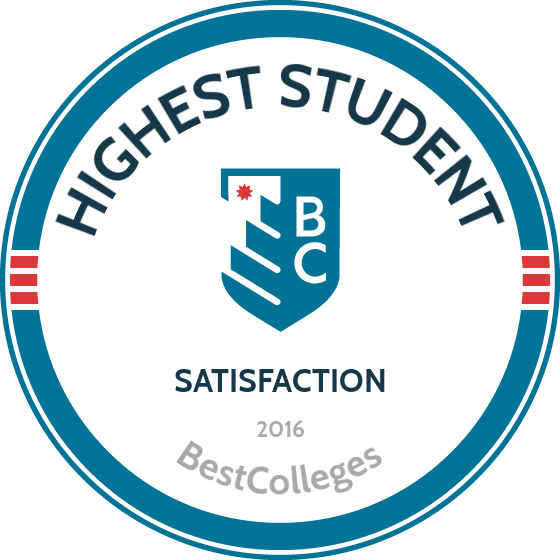 The lowest ranked school on our list or private universities (The University of Chicago) had a satisfaction rate of 74.67%, which is four percentage points higher than our top-ranked public university (The University of Virginia). Additionally, the endowments are typically higher, and the student-to-faculty ratios lower, at private universities than at their public counterparts. Another important consideration is tuition price ― a variable we have chosen not to include in this list. Student satisfaction is often linked to campus services, research facilities, and other amenities that often drive up the cost of education for those who enroll. If tuition is a major factor for you, then we definitely urge you to carefully research academic costs and fees before seriously considering any of the schools on our list.